Gluten free dinner great for kids on the go! In a medium pot, combine water, beans and salsa. Bring to a boil, reduce heat to low and add rice. Cook for 10 minutes or until rice is tender. Remove from heat, allow to thicken for 5 minutes. Heat a large skillet over high heat. Place wrap in pan, sprinkle with cheese and cover for 1 minute, allowing cheese to melt and wrap to soften. 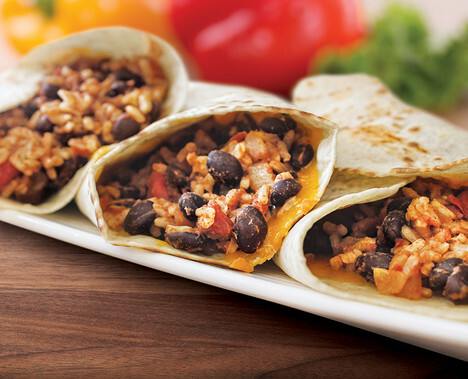 Remove wrap, add ½ cup of bean mixture to center of wrap. Fold bottom of wrap up. Fold sides to the center, fold over remaining side. Repeat with the remaining ingredients. TIP: This recipe has pantry ingredients that you can keep in the house at all times. Any leftover burritos can be wrapped in foil and reheated the next day.